Flowers June-September. Root smells of antiseptic. White frothy flowers with sweet fragrance. t is found on sites with less than 10 weeks of dry soil per year but 10-20 weeks wet soil per year. It is more tolerant of water logging than drying. 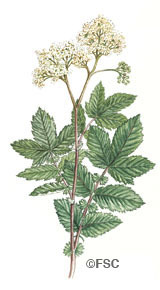 Meadowsweet is a key plant found on floodplain meadows. It prefers damper soils and can indicate the soils are rarely dry. If it dominates to the detriment of other smaller species, then an earlier cut and improved drainage should help to re-establish a balance of meadow species.